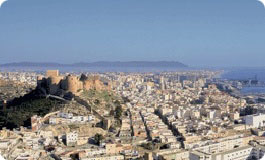 Almeria, only 40 km away, is the capital of the province, a large marine and commercial city with over 170.000 citizens, is located at the foot of a mountain range which the Alcazaba, an Arab fortress built by the Calph of Cordoba. The city offer a lot such as the Cathedral with its fortress like structure outside and its renaissance interior. The market "Mercado Central de Almeria" and areas of the center, with beautiful squares, such as the La Plaza de Vieja, and "Paseo de Almeria" the main shopping street and La Rambla "Av. Federico García Lorca" are the centers of the life of the town. Try Casa Puga, the best tapas bar in Spain. The port is one of the largest commercial port with ferries that sail to cities such as Ceuta and Melilla and cruisers from Greece and Italy. Close to La Rambla is the Cable Ingles mineral loader, reminds of the city's industrial past. The La Pescaderia Quarter and the Nicolas Salmeron Walkway , lined with palm trees, is another attractive part of the town. The Museo de Almeria (Archaeological) is well worth a visit. It is also interesting to take the way through the tourist populations of Aguadulce and Roquetas de Mar when you return back to Almerimar. Almeria East Coast offer of sun and sand is one of the most complete to be found in Spain, with a coast dotted with Blue Flag tourist beaches boasting a wide range of facilities, covers nestling at the foot of sheer cliffs and virgin un spoilt beaches lying within the boundaries of sites and outstanding natural interest. Take a trip at the east mountain coast. From Almerimar to Mojácar , Carboneras , Faro and Torre Vigia, Agua Amarga , Las Negras , Rodalguilar , La Isleta del Moro , Los Escullos , San Jose and Almerimar. Full day trip of 260 km. Almeria Alpujarra In order to take a walk by forests to one hour of the coast, an itinerary of roundtrip by the same way, where it is worth the trouble to enter itself by footpaths. From Almerimar to El Ejido, Dalías, Celín, Castala, Berja, Laujar, Rio Birth, Source Victory, Fondón and Almerimar. 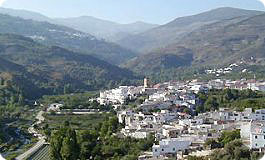 Alpujarra Granadina History full mountain towns. From Almerimar to Berja, Alcolea, Laroles, Trevelez, Capileira, Cadiar, Albuñol, the Rábita, Adra and Almerimar. Cat Cabo Magnificent beaches, natural coves and reserves. Cabo de Gate lighthouse, locked in by the Arrecife de las Sirenas or Siren Reef. It is said that this stretch of coast was once inhabited by hooded seals cries in the night caused sailors to talk of mermaids. From Almerimar to Almeria, Center of Interpretation of the Nature of the Amoladeras, Salt mines of the Cabo de Gata, San Jose and its beaches of Genoveses and Monsul, the Islet of the Moor, Playazo de Rodalquilar, Níjar and Almerimar. 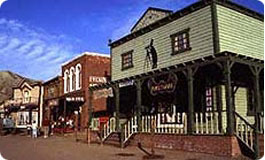 Desert of Taverns - Scenes of cinema The greater desert of Europe and the cinematographic recreation of the towns of the Officers' Club of Revolutionary Armed Forces Wester with spectacles including in Mini Hollywood , being able visiting in addition the Zoological Reserve . From Almerimar to Almeria, Sale of the Light, several scenes of cinema, Taverns, Turrillas, Lucainena of the Towers, Nijar and Almerimar. Granada, city with gothic architecture and Arab patrimony of the humanity. 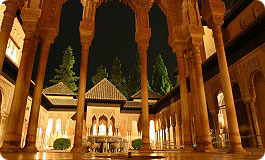 Dominated by the Alhambra, arguably the most exciting, sensual and romantic of all European monuments. It was the palace-fortress of the Nasrid Sultans, rulers of the last Spanish Moorish kingdom and in its construction Moorish art reached a spectacular and serene climax. From Almerimar to Motril , Lanjarón , Granada and back by the fast way A92 in the direction Guadix, Almeria to Almerimar. Start in the morning and use time on the way to Granada. The trip is in total 360 km. Mountain Ranges of Enix & Felex Almeria of the interior, geographies and people very different from the coasts. From Almerimar to the Inn, Enix, Felix, Alhama of Almeria, Paulenca, Rioja, Bath of Alhamilla Mountain range, Pechina, Viator, Almeria and Almerimar. 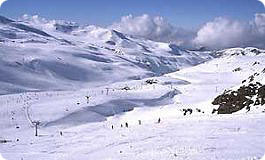 Sierra Nevada The Sierras are snowcapped for much of the year and offer Artistic skiing, Cross-Country, Inner Tube, Ice-Skating, Slalom, Sleighs, Snowboarding, Snowmobiling and Trek from end of November until start of May. During the rest of the year the Sierra Nevada nature park offers the walker endless opportinities. The desolate upper slopes of Mt. Mulhacen at an altitude of well over 3000m give the impression of being in a lunar landscape. From Almerimar to Motril, Lanjarón, Granada, Sierra Nevada, Almuñecar and Almerimar. 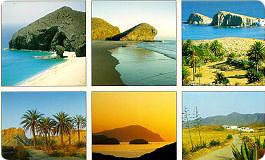 Tropical Coast Magnificent beaches, a monumental countryside of tropical fruits and caves. From Almerimar to Motril, Salobreña , Almuñecar, Nerja and Almerimar.